One of the biggest complaints we hear from “do it yourselfers” is that they find it impossible to be successful when they are color matching. They want to refresh their walls, but they don’t want to change the color and yet, when they start to paint, the color is truly off. Fulfill the Grandeur in Your Space by Treating Ceilings and Feature Walls. Looking to refresh the look of a high ceiling, peaked entry or vaulted ceiling? There are many creative ways to transform your Kitchen without the major expense of a full Kitchen Remodel. This Houzz article shows some beautiful and bright Kitchens with the warm touches of wood. By painting your existing cabinets and changing out the hardware, your cabinets can change dramatically. Create a warm wood touch by adding beams, a wood feature wall, or a mahogany island top – the ideas are endless! Let the experts at Stirling help you create Your Dream Kitchen. 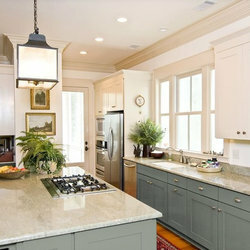 Here’s another great Houzz article offering 12 Great Kitchen Styles. For the outside out your house, the answer is from late Spring to early Fall when the air is warm and the days are long. Yes! There are great benefits of painting your home in the Winter months. You spend more time inside in the winter.. Enjoy it more! More attention given to your project: Painting Contractors are less busy and are able to focus on your project. Grays and blacks: the colors for cool people. Shades of grays and blacks, for too long, have been thought about as cold or dark. Not the case. In fact, they can be warm and inviting. They also pair well with virtually any color. What does this mean for you? Less stress when trying to figure out accent colors (such as artwork, accent pillows and rugs) and what color to paint adjacent rooms. A warm gray in a foyer area… Makes trim and decorations pop.